-Plate loaded by a Uniform distributed load, simply supported along edge. 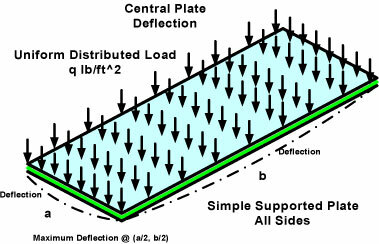 Deflection estimated at the panel/plate center. 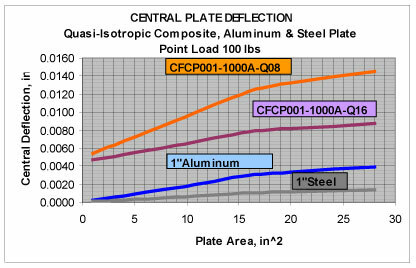 Quasi-Isotropic Skinned Sandwich Panel central deflection for a 28.8 lb/ft^2 uniform load compared to 1 inch thick Aluminum and Steel plates subject to the same uniform load. 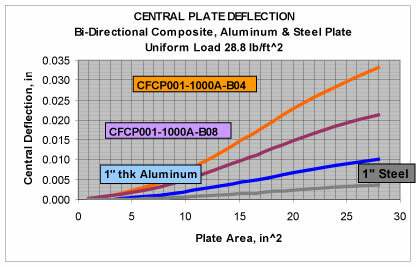 Bi-Directional Skinned Sandwich Panel central deflection for a 28.8 lb/ft^2 uniform load compared to 1 inch thick Aluminum and Steel plates subject to the same uniform load. Plate loaded by a Point load, simply supported along edge. 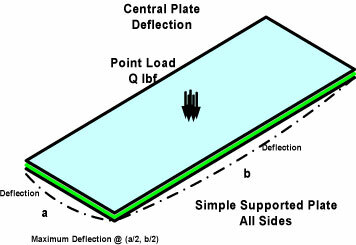 Deflection estimated at the panel/plate center. 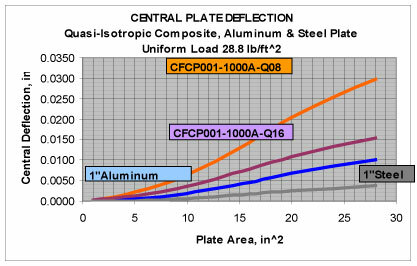 Quasi-Isotropic Skinned Sandwich Panel central deflection for a 100 lbf point load compared to 1 inch thick Aluminum and Steel plates subject to the same point load. 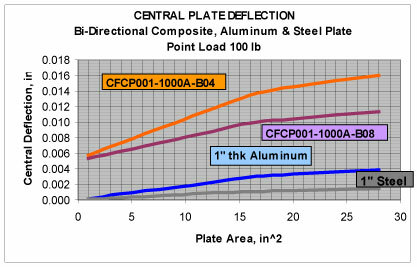 Bi-Directional Skinned Sandwich Panel central deflection for a 100 lbf point load compared to 1 inch thick Aluminum and Steel plates subject to the same point load.